Hold 0+ infant carriers are tough nuts under layers of stunning squidge. These from-birth burly bodyguards are big softies. Hold holds tight in a happy hug. Free chest pads, tummy pad and headhugger add to the cosy credentials. Just pop on and off the Ooba chassis or the new Giggle2 chassis - from car seat to high street there's no mid-journey mither when you're pulling manoeuvres. Hold infant carrier also connects smoothly with the Hold in-car base – (isofix or semi-universal belted base - sold separately). Protected by tough tech and squidgy stuff, petite pilots are road-trip-ready. The closest you can get to holding your tiny traveller, Hold holds newbies snug. No car seat with a base ever looked like Hold; a beautiful, babyful bundle - Hold makes history. The bow is back. Cosatto's iconic Golightly design makes her long-awaited return with a revamp. Spawning a million imitations, Golightly's black and white stripes and jaunty red bow made history. This time Golightly pinks it up. Meet Golightly 2 with the pinkest of bows. Roll your mini starlet into the future with a shock of fuchsia. Monochrome stripes bring a trendsetting geometric statement and classic polkadots dance under the hood. Conform to BS ECE R44/04. Register your new product within 28 days of purchase to qualify for Cosatto’s fab FREE four year guarantee. These babies rock. Literally. Sturdy and still in the car, they convert to little rockers on the ground when it’s lullaby time. 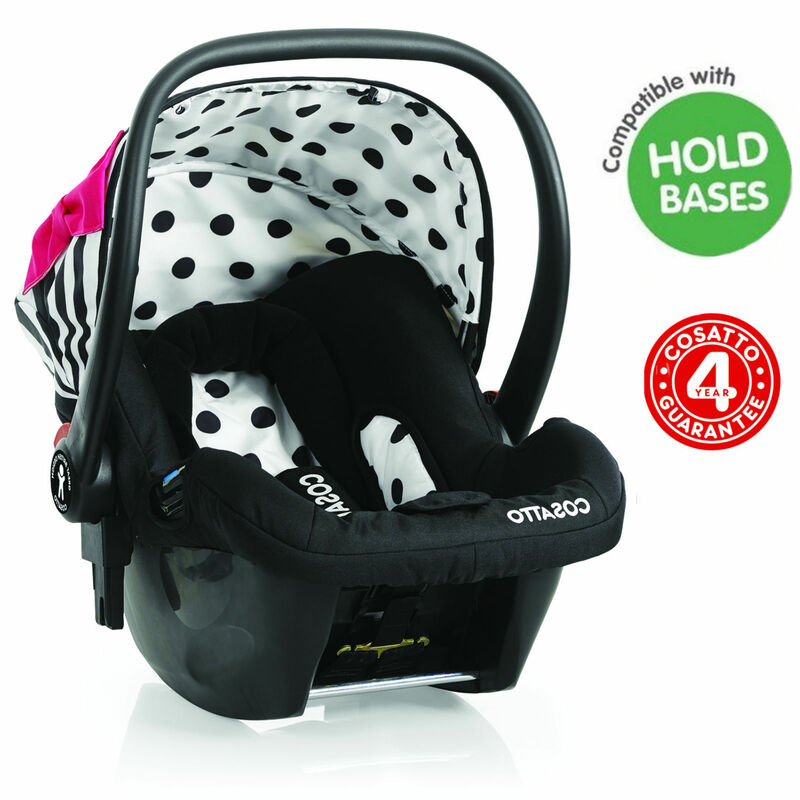 Let little one get on the move from birth with this snug car seat/infant carrier. The cheeky hood gives shade on sunny days. With padded seat cover and squidgy headhugger, these beauties are Cosatto cosy. They are safety serious at Cosatto. These car seats may look all friendly and soft but underneath they are hard nuts. Believe us, these are no plush pushovers. Soft on the outside and tough on the inside the group 0+ gang passed the cruel Cosatto initiation and earned their stripes, (and patterns and colours). Cosatto car seats are subjected to rigorous testing. They launch them at speed down an acceleration lane at an accredited test house. It’s serious stuff.